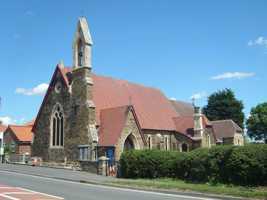 St Barnabas was formerly part of Blyth parish. Erected in 1878 to a design by Ewan Christian the church is built in Ancaster stone and consists of a chancel (added in 1890), nave, porch and an unusual bell turret containing one bell. There is also a vestry attached to the south-east end of the nave, with a separate doorway and tall chimney. The porch is at the south-west corner, with a steeply pitched roof bearing an iron cross and a neo-Gothic doorway. Another small cross can be seen on the apex of the east gable. The chancel stained glass window has three lights depicting the Crucifixion, the Virgin and St John. There are three single-light lancet windows in between slim buttresses on either side of the nave. On the south side, the war memorial stained glass windows represent St Martin, St George and a Roll of Honour. On the north side a window depicts Christ with the children and there is a memorial window depicting St Anne. At the west end of the church is a three-light window with a circular window high in the gable end. The official link with Blyth changed when Ranskill and Torworth became part of the newly formed Parish of Scrooby.